MARIANNA, Fla. — Jackson County officials say if the 27 remains found at the Dozier School are human, they will be carefully maintained. County Commissioner Jim Peacock said the archaeological department of a local university will be coming in to investigate and that the citizens of Jackson County would never desecrate a human cemetery. The remains were found by a subcontractor last month in an area where livestock used to be housed. 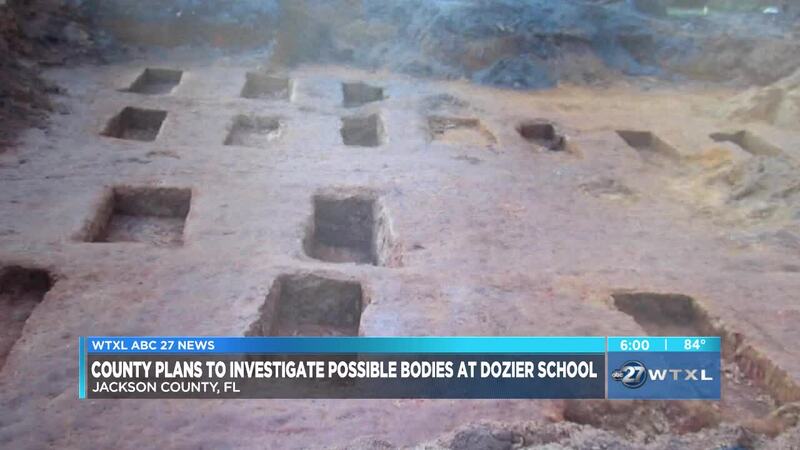 Dozier School was known as a reform school, where documented abuse happened for decades and some of the students who died were buried on the property. It was shut down in 2011. The following year more than 40 remains were found. 21 of those were identified in 2016. A group of men known as the White House Boys, abuse survivors who attended the school, helped reveal the horrors that took place. "If they scanned the whole grounds of tat school, I guarantee you they would find another 200 to 300 dead more boys buried on those grounds," said Terry Burns, former Dozier School student. We spoke to Jerry Cooper, President of the White House Boys Organization, over the phone Friday morning. Cooper said he's "not surprised" by the discovery and he wants a forensic search of the property. He said mental and sexual abuse were rampant at the school and the state allowed it to happen.